Happy birthday to Stewart and diva! I can’t believe they are 5 years old! He has really matured and is a wonderful dog. My best friend! He’s definitely still a weimy and still stubborn as all get out. But he’s a lot calmer and listens a LITTLE better 🙂 I can never thank u enough for giving me such a wonderful companion. 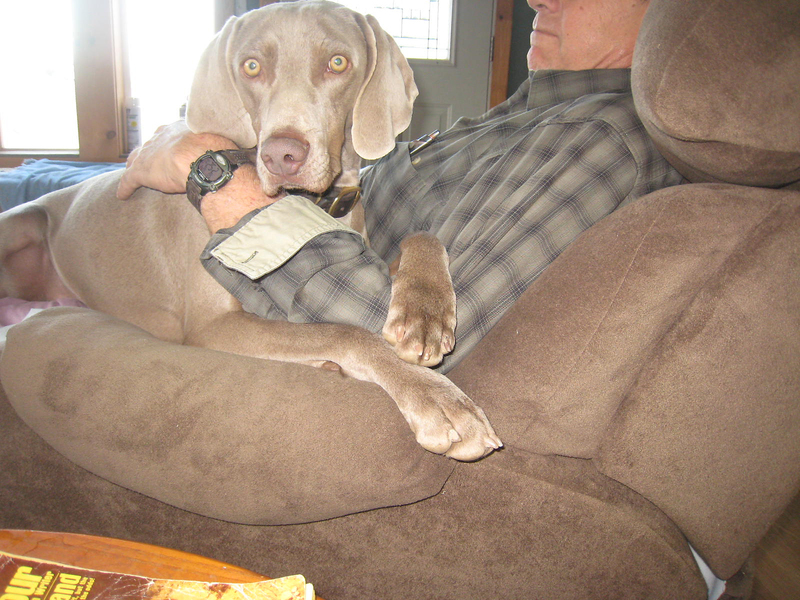 Hope all is well with u and cliff and all those beautiful weims. Take care! Breeder’s Note: Diva is Stewart’s litter-mate (sister) which Cliff kept to hunt-train. 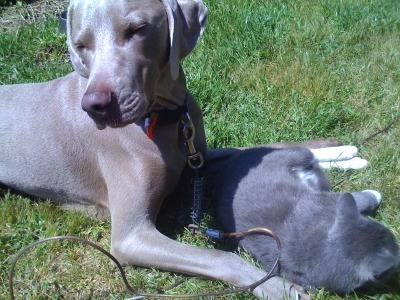 He still has Diva, and you might have seen the video of the three blue Weims running in the field with Diva. If you did not see that video, you can click here to find the video link. I Can’t believe my Stewart is 4 years old already!! He is a great dog. Still stubborn as can be. But he is also the sweetest buddy I could ask for. We did end up getting him a puppy! My boyfriend really wanted a golden retriever/ lab. We finally found one this summer. He’s half golden and half yellow lab. He’s so different from Stewart. So calm and eager to listen lol They absolutely love each other. They sleep together and play together all day. It is hard to believe that Stewart is four years old! Yes, we got another breed, but no dog could ever compare or have my heart like Stewart. I’ll be forever thankful for u giving me my bestest friend!! Breeder’s Note: Many of you know Cliff’s Diva. Some have met her on a visit or run across them during a hunt test. Diva has made us proud! She has the potential to do anything, that we have the smarts to train her for, but she is more than that to us. Diva is not only smart, but she is super friendly, fun, and well demanding too. 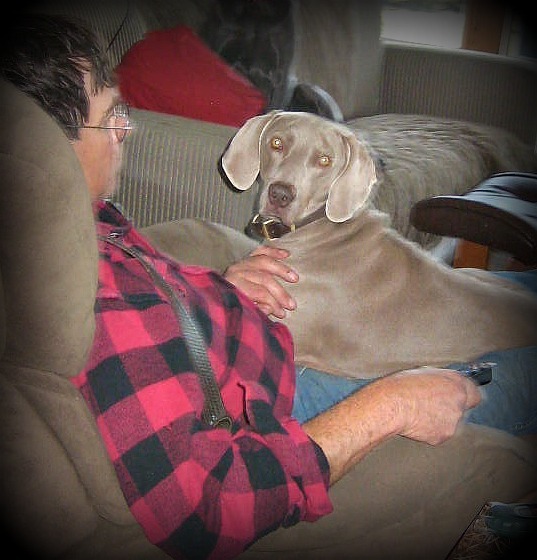 She loves to lay on Cliff’s lap and snuggle with him! She is accomplished in the water and on land! 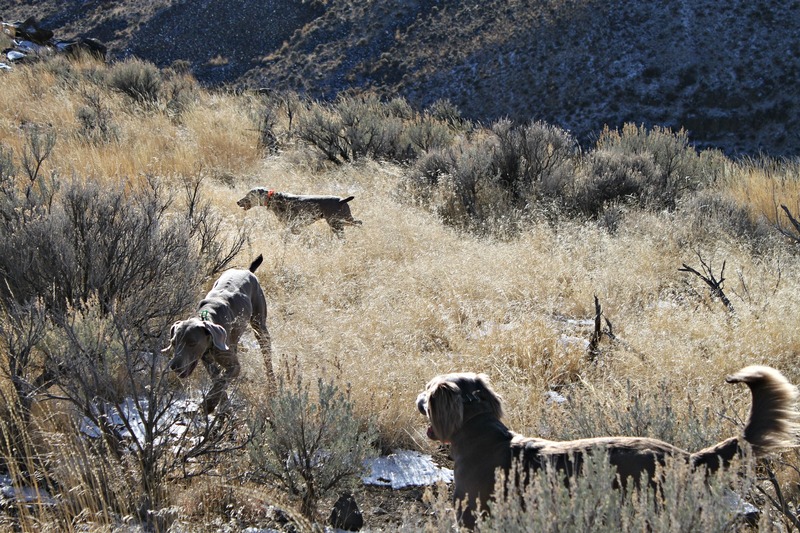 Cliff likes to do an annual chukar hunt in the Owyhee sagebrush for his birthday. 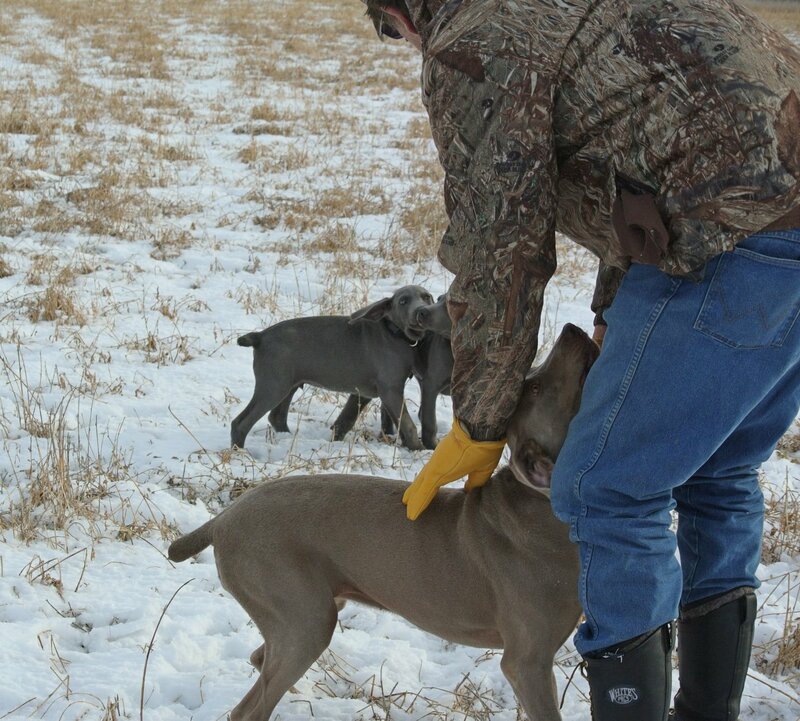 Last Saturday he and our grandson-in-law Nick ventured out with three Weims: Stackhouse (the longhair Stud), Zee (Stewart and Diva’s father), and Diva. Click here to watch Diva on a YouTube made a couple of years ago working in water. Below is a photo from last Saturday of the three working the sagebrush! I want to know if invisible fencing is a good idea? 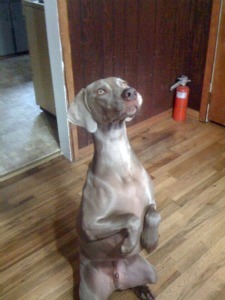 Many who live with the Weimaraner swear by invisible fencing. Some live in areas where fencing would not be allowed. Others live where fencing would deter their view and they really want to avoid that scenario. Having said that there are some who use it successfully, and others who wish they would never have opted for the invisible fence. 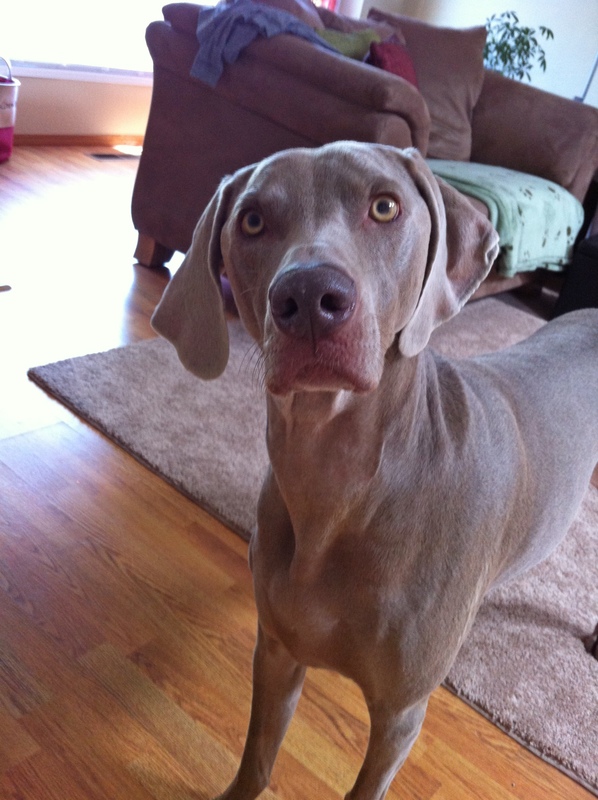 The idea that a shock will deter a Weimaraner from ever going outside the boundaries is not true. Seeing their owner, seeing a deer, seeing a bunny, may negate the fear of the limits. 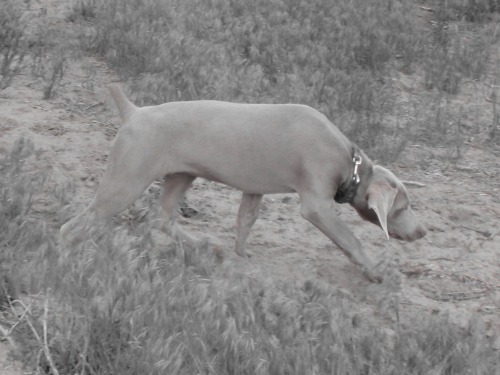 The Weimaraner might give chase to that critter. They might also burst through to if they see you–their beloved human. 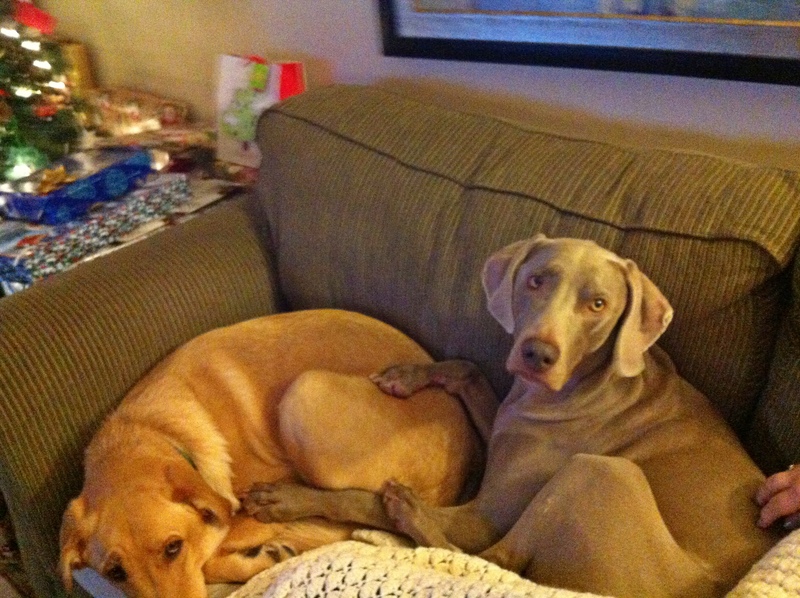 The Weimaraner may forget about the penalty and cross over to the other side. This is probably the exception rather than the rule. 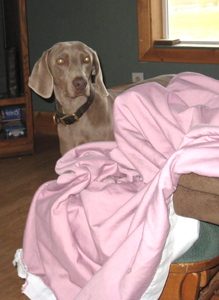 A boundary-trained Weimaraner may honor the boundary 99% of the time. It is the 1% that is unthinkable. These times are totally unpredictable and normally driven by the instinct to give chase. 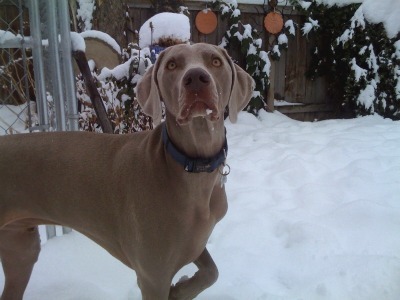 Other than the danger posed by the Weimaraner leaving the property, there are other consideration. May people put up a fence to keep out other people, critters, and especially dogs. 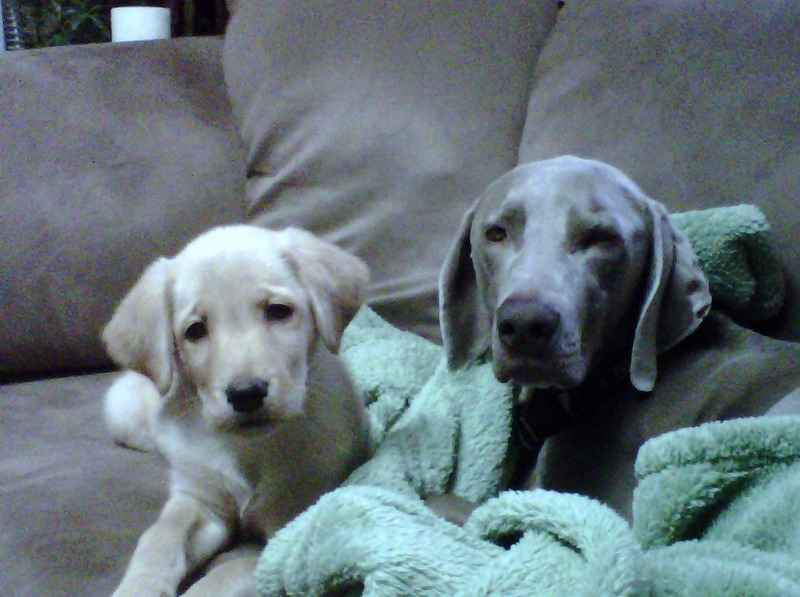 If you are thinking about adding a Weimaraner and invisible fencing is a must, you should take pause. 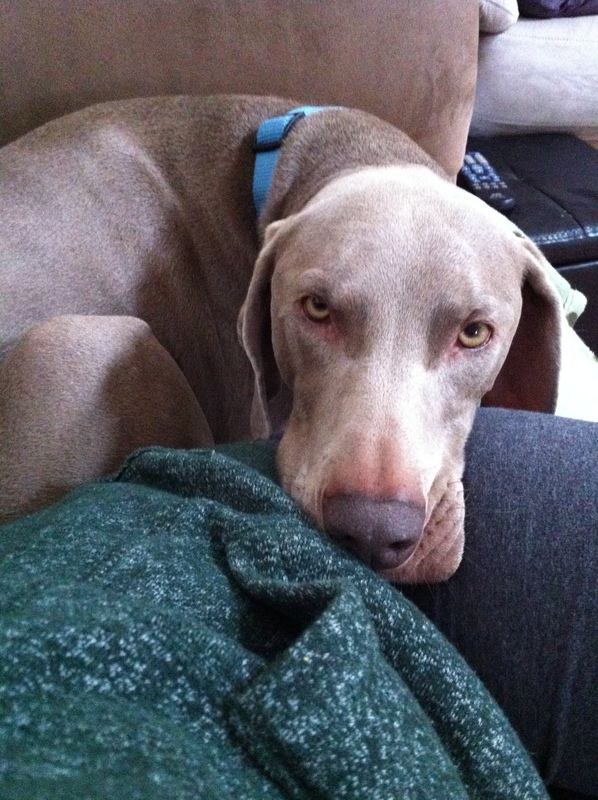 Not every Weim is going to honor this boundary. 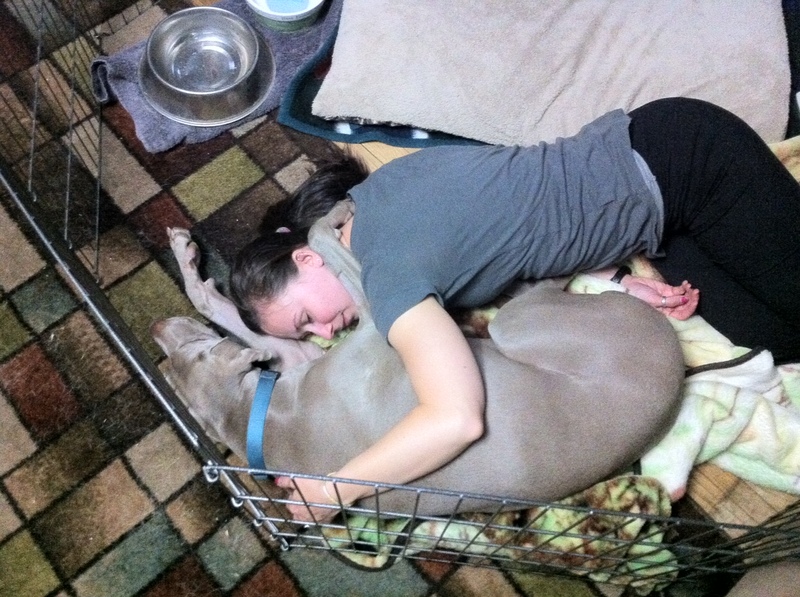 In checking online there was a Weim in rescue for ignoring the invisible fence. How sad is that? Although some might want to rethink using the invisible fence, some are sold on it. Beyond security, the invisible fence has uses as a training tool. 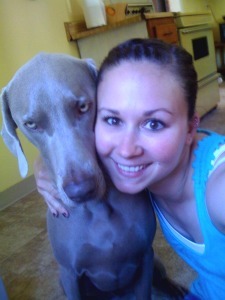 No one option is going to work for every person, every situation, or even every Weimaraner. 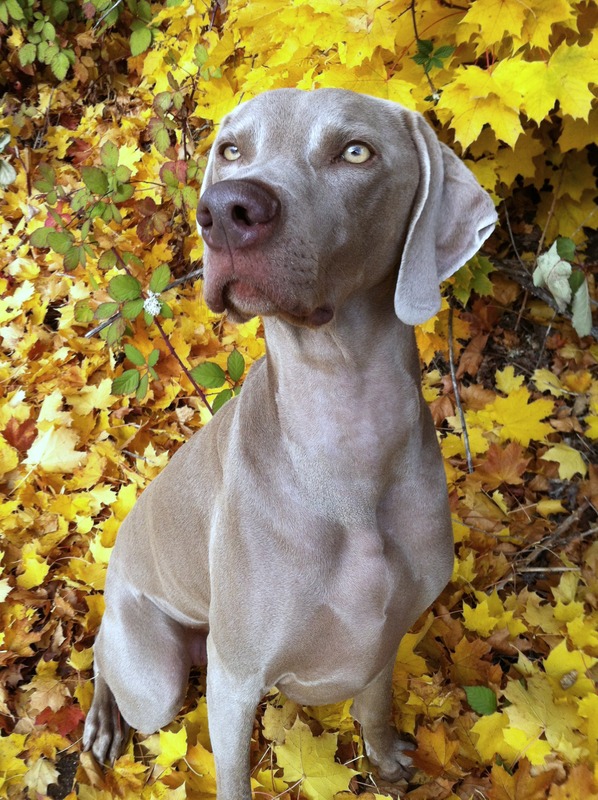 Our thought in closing is that if you must have only an invisible fence, or you cannot have a Weimaraner then maybe you should not get a Weim. Here is our yearly update. Stewart is 3 today!! I just can’t believe it. He is finally starting to calm down a little and listens way more. Lol. He is my best friend. Can’t imagine life without the little guy. He’s a pretty good looking dog if I do say so 🙂 thanks again for breeding good, beautiful dogs. His hunting insticts are crazy. Kinda wish I hunted. He’d b so good. Happy Birthday Stewart and all his littermates! wooooohoooo! Clay turns three today!! He is doing great and is constantly by my side……goes to work with me everyday! I love him dearly….thanks for my best pal Clay! Even persons of few words remember us and it means the world. 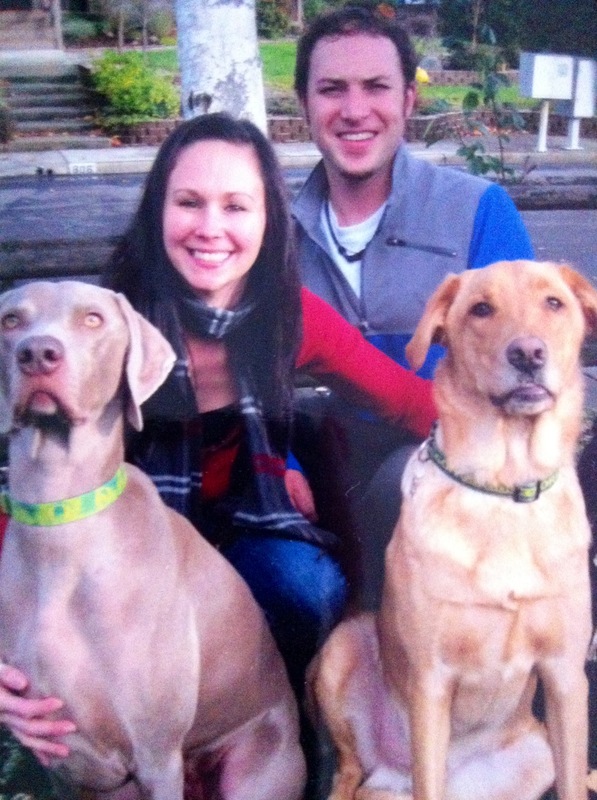 Our OwyheeStar Weimaraners touch hearts in ways words cannot express. Thank You for remembering us! …..is Cliff’s almost constant companion. She can do almost anything. She has been proven in hunt tests and has become a frequent Northwest Head-turner…. Here is Cliff’s Latest Diva Tale…..
As most everyone knows, OwyheeStar acquired quite a few pheasants and chukars. This project has led to a lot of additional activity around the Nielsen Farm. Additional activity means the additional birds require adequate housing and a flight pen. By this time Cliff had already created one pen for the young pheasants. Now, Cliff needed to create another for the chukars. They had escaped their swimming pool and had taken over the entire inside shop work area. It was imperative that Cliff get them moved to their new home. Once Cliff had the areas cleaned it meant rebuilding–closing holes and adding chicken wire etc. He had to build secure doors and automatic waterers. It was like most projects–larger than the original plan! While working on the expanded bird area Cliff lost his carpenter’s pencil. 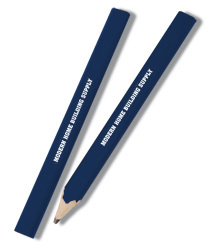 He spent some time searching for the pencil but alas he counted it as lost. As usual Diva was near by exploring and keeping watch. This is the normal Diva mode. All the while she remains attuned to Cliff and keenly aware of what he is doing. Therefore, it was no surprise that when Cliff headed for the shop in search of another carpenter’s pencil and Diva caught up with him. Acutely aware that Diva had fallen in stride with him, Cliff looked down. There was his Diva her head tilted towards him. Perched in her mouth, Cliff’s missing carpenter’s pencil. Cliff said Diva’s expression seemed to say, “Is this what you are looking for Dad?” Cliff could not help but laugh at his very special side-kick. She does it all! She swims, points birds, retrieves birds, and finds lost objects. Oh and she expects to be a lap dog in return. The doggie bed is OK on occasion, however, every evening she must climb atop Cliff’s lap and snuggle. Last night Lacee came into join us and Cliff thought Diva and Lacee could share the dog bed. Indeed there was enough room but likewise they felt there was enough room for the both of them on Cliff’s lap. We grabbed the TV remote to save it and moved a few other things before stuff went flying off the end table. 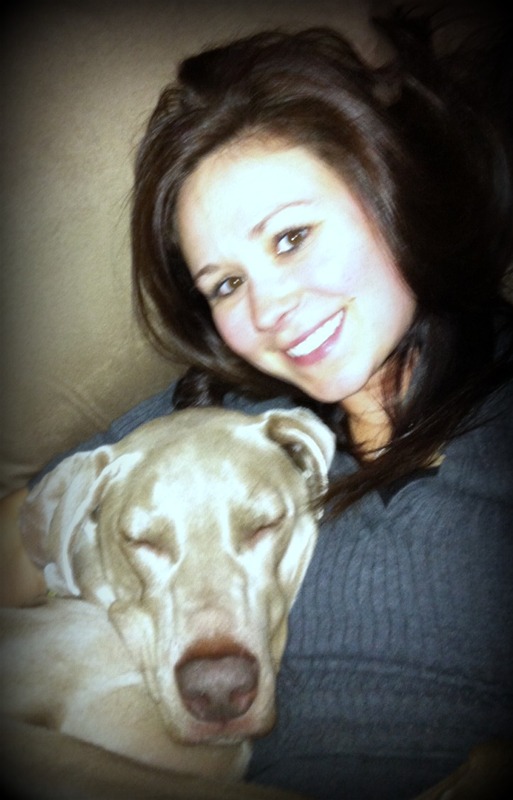 The joys of life with a Weimaraner are many! 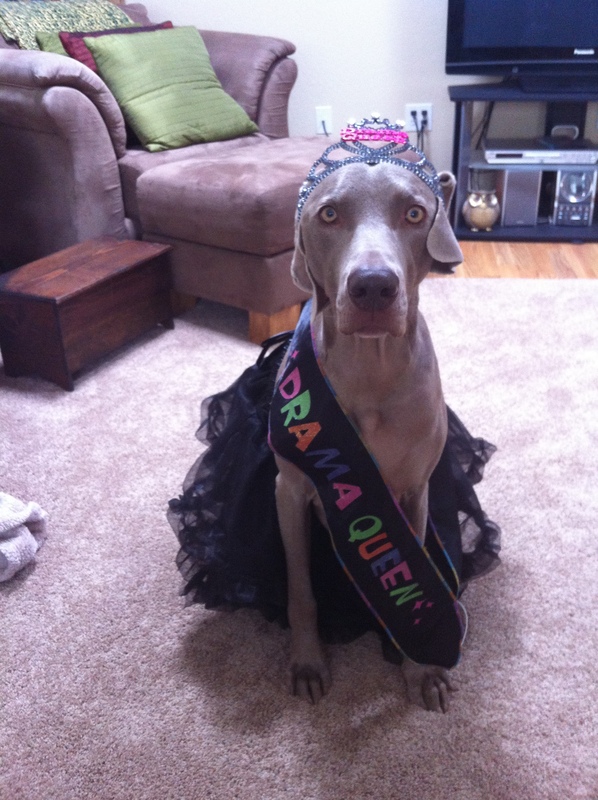 Thanks for reading one of our OwyheeStar Weim Tales!